Your Cookville Dentist Always Checks for Cancer Symptoms! Your Aunt’s text message knocked you off balance, although it really shouldn’t have. As long as you can remember, she’s smoked and drank avidly. It’s no surprise that her lifestyle lead her down the road to developing oral cancer. Still, receiving the message that she’d been recently diagnosed was disheartening. 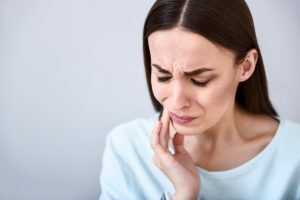 Luckily, your Aunt’s dentist was able to recognize the signs of the disease by performing an oral cancer screening during her regular dental appointment. Dr. Robert C. Sikes can help patients just like this one every time they decide to visit our dental practice. During each dental appointment, your Cookville dentist will perform an oral cancer screening. Our office understands that awareness is the first step to prevention, so we put together this post to help patients recognize the real threat oral cancer poses and what to look out for. Did you know that the estimated new cases of oral cancer to be diagnosed is up to 49,670 in 2017? Or even bleaker—that just about 9,700 people will die from oral cancer this year? In most cases, the cancer cells are detected in its late stages, resulting in an unnecessarily high death rate. In fact, 40% of patients diagnosed in its late stages die within 5 years. Quite the reverse, early detection has a survival rate of up to 90%! Recognizing the signs early on is critical to slowing down and even halting the progression of the disease. Whether we’re cleaning your mouth top to bottom or performing a root canal, your Cookville dentist and dental hygienists at the Robert C. Sikes are on the front line when it comes to keeping you and your family’s oral health up to par. There are a couple ways that our dental team helps to increase awareness and educate our local patients. Both the American Dental Association (ADA) and American Dental Hygienists Association (ADHA) recommend that dental professionals always perform routine oral exams during all patient appointments—including looking for signs of cancer. Research has shown that only 29% of patients had been screened for oral cancer during their last checkups and more patients (actually 81%) prefer to be screened every dental visit. Because we work in your best interest, our dental practice will not allow you to live in bliss if your lifestyle is making you a high-risk patient. During your dental appointment, your doctor will stress the importance of keeping your dental appointments and eliminating tobacco and excessive alcohol use. By following these simple steps, you could dramatically decrease your chances of developing this debilitating disease. Our team takes the threat of oral cancer seriously. We provide screenings as a vital part of your regular checkup. Dr. Sikes will meticulously review the oral tissues in your mouth, head, and neck area for signs of oral cancer. It’s important to visit a professional because they will be able to distinguish signs that you may not be able to see with your blind eye to dentistry. If our team notices anything suspicious, we can discuss the next steps we will take to getting you a concrete diagnosis. Contact us today to schedule an appointment. Comments Off on Your Cookville Dentist Always Checks for Cancer Symptoms!